Goo.gl is yet another URL Shortening service. But it is from Google! As of writing this article, you can use this URL Shortening service from Google only via the Google Toolbar. 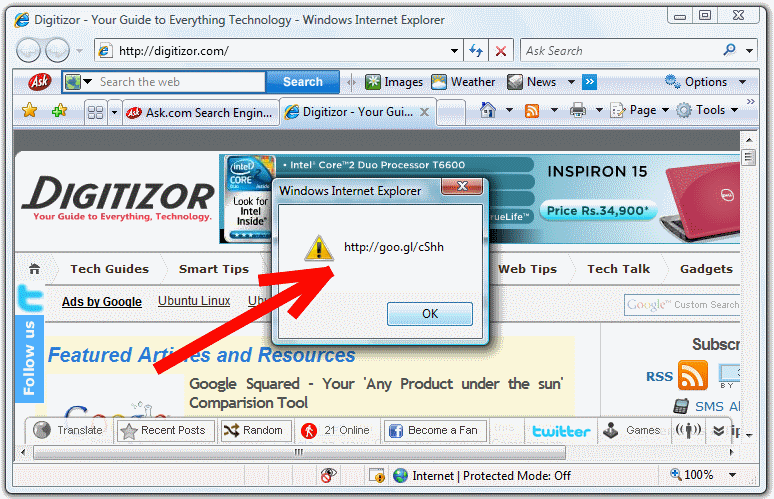 But in this article we will tell you a method by which you can directly shorten your URLs with Goo.gl and without installing the Google Toolbar. We present you this bookmarklet using which you can shorten any URL via the Goo.gl URL Shortener but without using the Google Toolbar! Cool, isn't it? The best part about using this bookmarklet is that it works also with the Opera and the Safari browser....that are otherwise not supported by the Google Toolbar. Just Drag the "Goo.gl this page" bookmarklet as shown above to your Browser's Bookmarks Bar (or Favourites in Internet Explorer). When you have to Shorten an URL using the Goo.gl service just click on the "Goo.gl this page" bookmarklet from your browser and you will get a popup as shown below.